​Basketball is one of those fun team contact sports enjoyed on the ground, but have you thought about how the fun takes to the next level when the game is played in water? 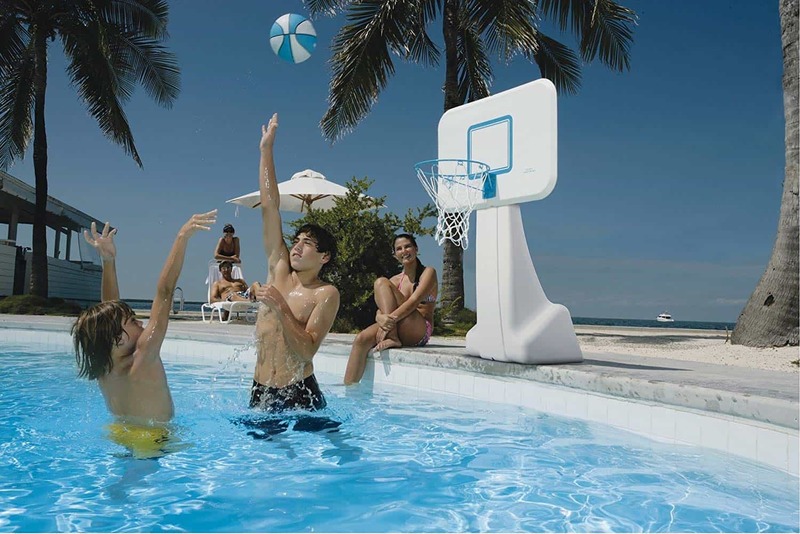 Invest in a good pool basketball goal for your next bonding time with your family and friends. You don't have to worry about which game to play - all you need is just a proper ring that could either float on the water or be durable enough for dunks on the poolside. Here are some of the best pool goals you can purchase. ​The Dunnrite Splash and Shoot Basketball Hoop Set contain a backboard made from Polyurethane. The set also includes a round, heavy-duty aluminum powder-coated pole. The telescoping pole can adjust the basketball hoop up to 56 inches above the swimming pool deck in infinite increments. The whole assembly is supported by a super-tough polyethylene basketball hoop that can hold up to 25 gallons of water. It can weigh up to 200 pounds when the base is filled with water so you are exactly sure that this can properly hold the frame of the basketball set-up. ​The ring doesn't snap when it has added weight or when someone dunks the ball in the hoop. ​Not that easy to set-up. ​The base can be quite heavy to lift, so it's going to be hard to move around and will also need a team. ​Overall, this is a great buy! Yes, the bases and whole assembly may be hard to move around, but the weight is what brings everything to be put together. This can simply be resolved by trying to put the bases in a semi-permanent place, or the water can be filtered out of it to lose some of the weight. Without a doubt, you can use this for dunk games. 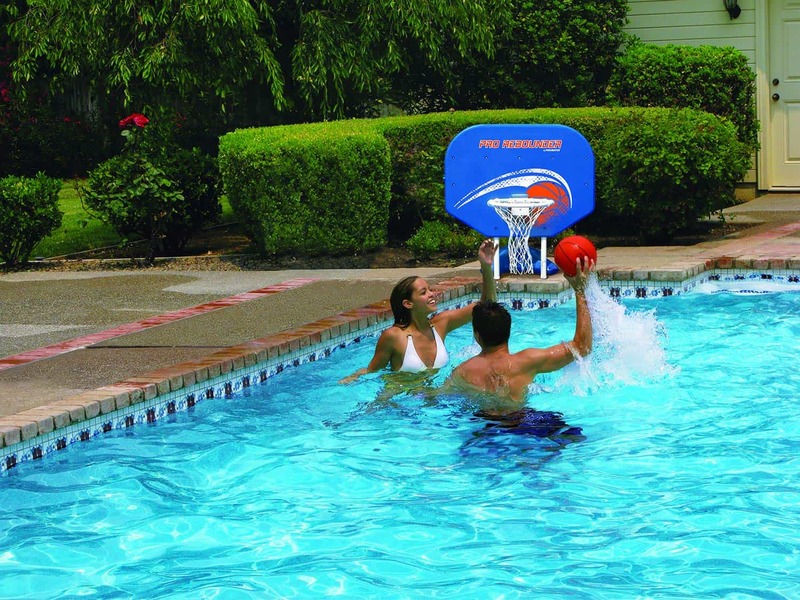 ​The Poolmaster Pro is specially designed for poolside basketball action. It is made from durable all-weather materials so you won't have to worry about using it on certain seasons only. It has a hard-body backboard that measures 34-inches wide and 25.5-inches high. The base is made from polyform materials, and it can be filled with either water or sand for added poolside stability. This pool basketball set is perfect to sit on the deck for both in-ground and above-ground pools. The set contains a 14-inch hoop, all-weather handwoven net and game ball with inflation needle. ​The whole set is constructed from durable all-weather materials. ​It can be assembled easily within minutes. ​The assembly can be moved from one place to another. ​It comes in the complete game set so you won't have to look for other materials needed to play pool basketball. ​The game ball included in the set is subpar. ​This poolside set cannot be used for dunking games. ​This is an easy-to-assemble ​pool basketball hoop, so you don't have to worry about trying to get it in and out in no time. It can be stored easily when not in use. This is good for casual playing but not for that intense and raunchy gaming. ​The Swimline Cool Jam Pro Set is a commercial quality poolside basketball set-up. The height of the ring can be adjusted, depending on your preference. It has a super-wide moded hard body backboard for added stability. The set comes with a regulation size game ball, metal hoop, and heavy-duty net. ​The bases can already hold the weight of the whole set-up. There is absolutely no need to put water, sand or other weight-bearing materials for it to be sturdy. ​It can quickly be moved around the poolside. ​It takes up some space. ​The hoop has the tendency to be rusty, so extra care around that area is needed. ​It is not suitable for dunking. 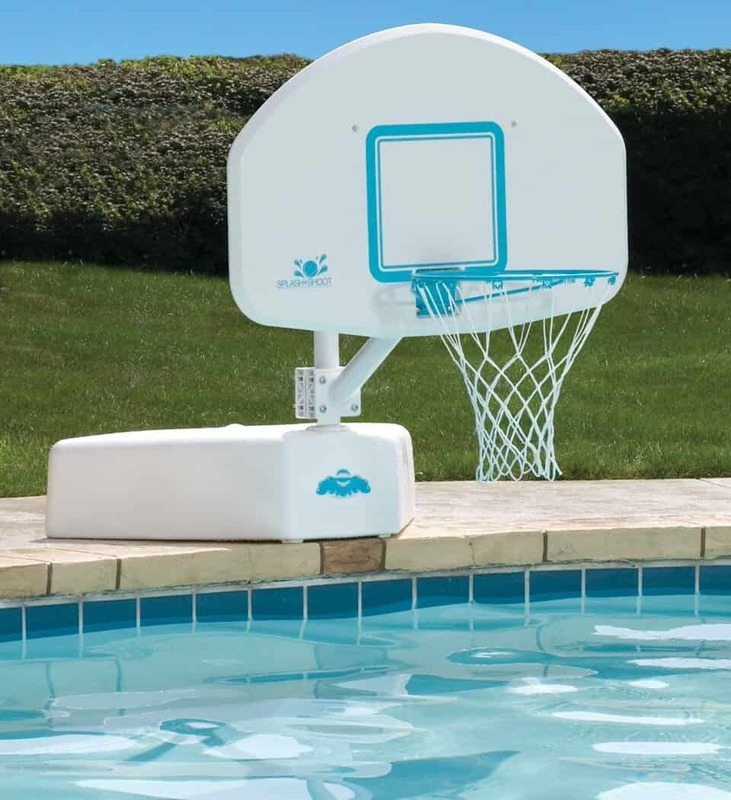 ​The Swimline Cool Jam Pro Poolside Basketball Goal set is a great buy especially if you don't want to put in extra effort filling the bases. The base of this set is very wide for added stability itself. Since it does not need any extra weight to be used, the whole assembly can easily be moved around the poolside anytime. ​The Dunnrite PoolSport comes with a 13.5-inch vinyl coated stainless steel rim that stands at a fixed height of 36 inches above the deck. The base can either be filled with sand or water, depending on your preference. It also comes with a mid-size diameter color matched ball, hardware, net, and rim. All of the hardware used in this set is made from durable stainless steel. This product also comes with 3 years limited warranty so, if ever you are going to have any issues, you can be ensured with the manufacturer warranty. ​The base can be filled with water for added poolside stability, and it can also be taken out easily when it is time to store the set. ​The hardware needs to be extra taken care of to prevent rust formation. ​It can be a bit hard to move around once water or sand is placed in the base. ​The net can eventually sag over time. ​With proper maintenance, this can last for a long time. If ever you are having doubts, this poolside basketball is a good buy. The fact that this has a 3-year warranty is also a major plus! 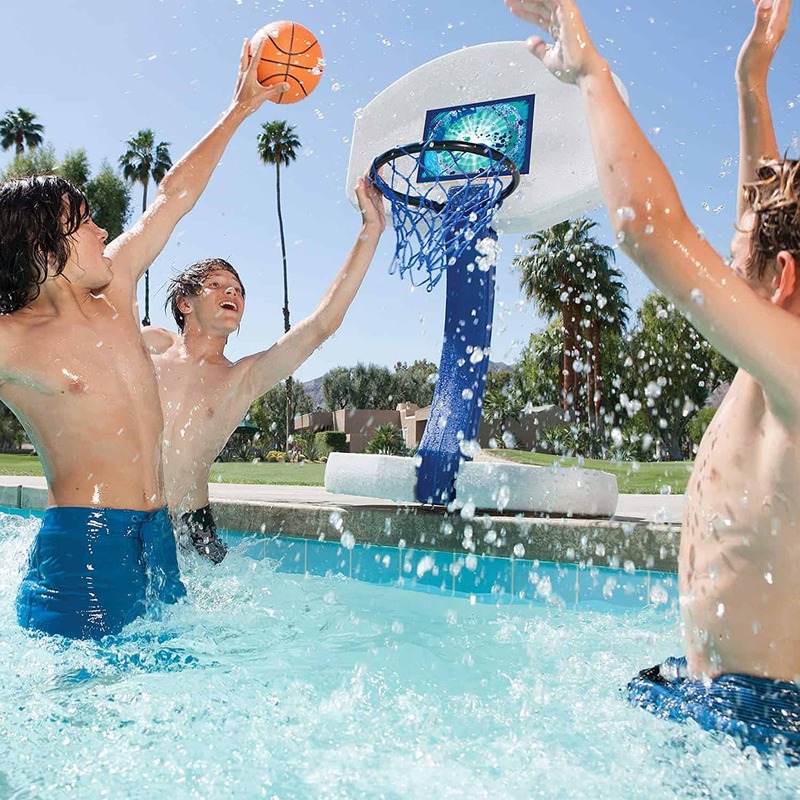 ​The Lifetime Pool Side Basketball System consists of a 44" Shatterproof Fusion Backboard which is integrated with a polycarbonate playing surface with an unbreakable polyethylene frame for a durable and pro-glass look. The pole is protected from the harsh ultraviolet rays of the sun. The all-weather protection makes it more durable, sturdy and extends its service life. It also has a base that can hold up to 27 gallons of water that can provide stability and portability. Its pole has a telescoping height that can reach up to 6.5 feet. Its round steel poles are coated with powder for extra protection and it has a weather-resistant finish. The original classic basketball rim features a solid steel ring that is supported by a brace and an all-weather nylon set. ​It can easily be moved around and can be stored when not in use. ​Its backboard has the Shatterproof Fusion technology. ​The height of the poles can be adjusted up to 6.5 feet from the ground. ​Extra care is needed for the hardware since these are prone to rust. ​The whole set needs to be dried out before storage to avoid corrosion of metal. ​It is a bit tricky to install. ​The Lifetime brand has always been known for its durability and service life. They have done it again with this poolside basketball system. The metal parts just need to be spray coated with chemicals that will prevent the corrosion of the metals, but everything else is a good deal with this poolside basketball goal. ​The SwimWays 2-in-1 game contains the two most popular pool games which are basketball and volleyball. With this set, you can easily switch from playing basketball to volleyball with ease. It is easy to assemble and there are no tools required to set the system up. You can enhance the stability of the bases by filling it with water. The whole set comes with a 24-foot long volleyball net, 2 basketball hoops and a ball for each of the games. ​The water can easily be drained out from the base. ​There is no metal hardware, so there will be no room for corrosion. ​The whole set-up is durable. ​The rim for playing basketball is not suitable for added weight; dunking is not possible. ​The hoop for the basketball ring can be a little challenging to push to connect it with the backboard. ​The filling of the water for its bases may take some time and effort. ​The SwimWays 2-in-1 game is a great buy especially if you are leading more towards playing two games. Plus, it does not hurt to have both! Two poolside games mean twice the fun. ​The Swimline Giant Shootball is perfect if you want your goal not to be on the poolside. 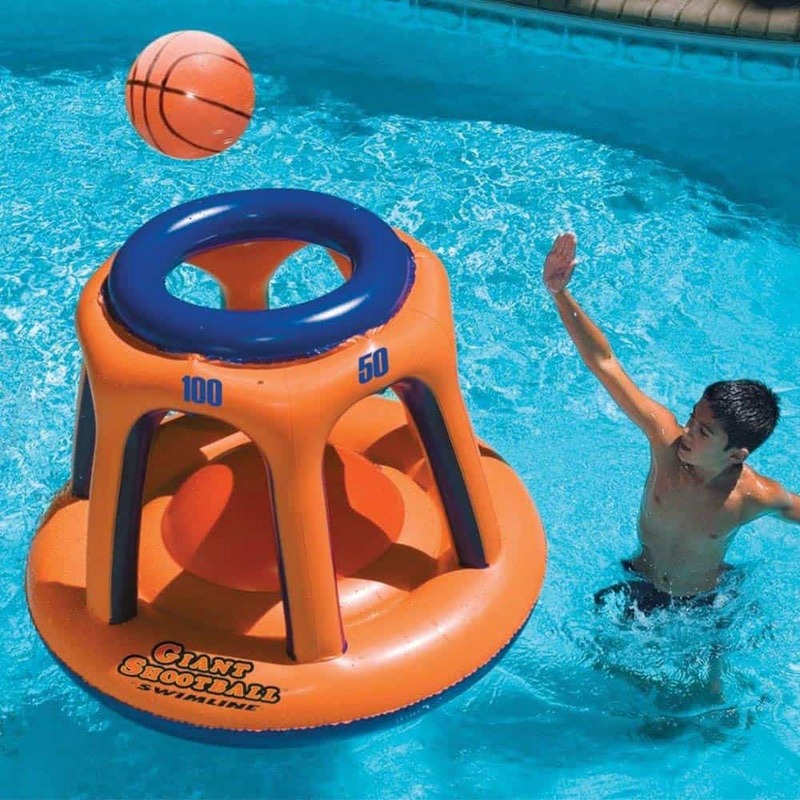 This is an inflatable basketball ring which you can drag around your pool area. It comes with an inflatable ball and when inflated, it is 45 inches tall and 36 inches wide. ​It's easy to set-up, remove and store. ​It does not take up any of your poolside space. ​This just needs to be inflated, there's no need to fill it with water or sand to keep it stable. ​The ring floats around the pool with you as you play and swim! ​It needs to be thoroughly filled with air for it to become stable. ​When not stored properly, sharp objects can punch through the material and leave holes. ​It cannot hold the air for more than a week, so you have to reinflate it every now and then. ​With this inflatable ring, you just really need to be careful with the storage. 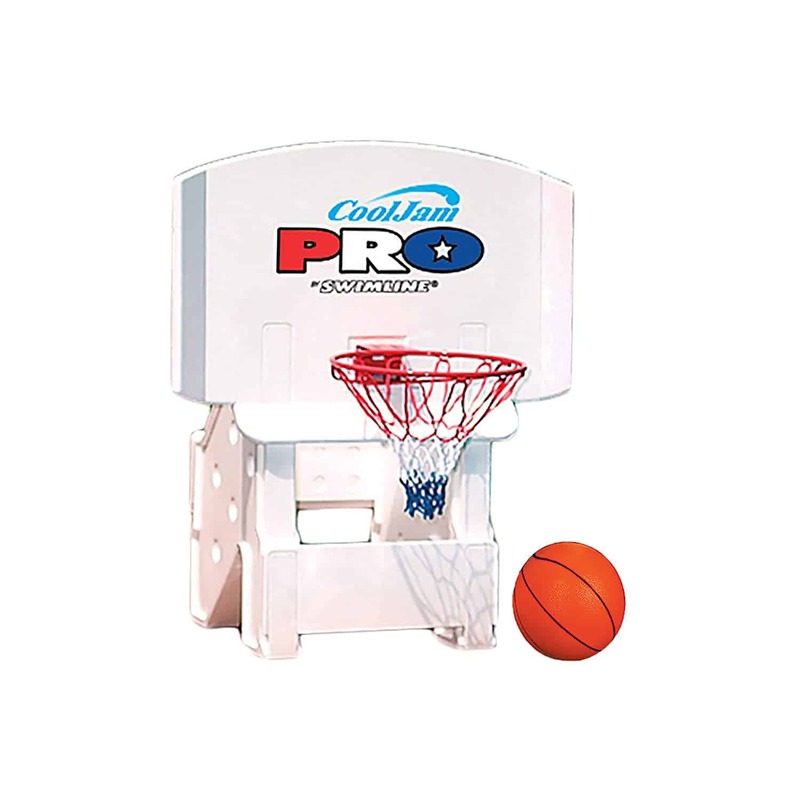 It's sure that this can add additional fun to your basketball game. This is not stationary so you can move this around the pool allowing you to shoot the ball from any angle. ​1. Decide if you want to inflate or put water in the bases. Generally, there are two ways you can add stability to the poolside game equipment. It's either you put water or sand inside the bases, or you inflate the whole set-up with air. There are pros and cons for each, for those bases that can be filled with sand or water, this equipment can be placed directly on the poolside without you having to worry about it getting knocked out during the game or by forces of nature. The downside, however, is that after filling the bases, these can be too heavy to move, so you have to drain it before moving. For the inflatable ones, it is easier and faster to inflate, but its stability won't work much on the ground as it is built to float on the water. So before buying pool basketball hoops, you should gauge which are the stabilizers that are more accessible for you. 2. Check the size of your ball. If you opt to use a ball of your own, then you must first check its diameter so you can be sure that it will fit in the rim. If you currently don't have a pool basketball, there are basketball sets wherein the balls are included. We recommend you to get those with the ball or balls that are made from the same manufacturer to get the best playing experience. ​3. Evaluate if you can compromise dunking. We all know that dunking or hanging on the ring of the hoop is not uncommon when playing basketball. When it comes to pool basketball, you might have to compromise just that. For one, the bases are not designed to hold additional weight rather than that of the assembly. This means that extra weight may result in damage to the equipment or injure the people playing. If you are certain that a no dunking rule may not be implemented well between your group, then check for those poolside basketball hoops that are stable enough to do so. Often times, some high-end durable hoops can withstand dunking but only for a certain amount of time. When the hanging is prolonged, it can sag the ring and may eventually break. 4. Check if you have poolside and storage space. This is where the inflatable versus non-inflatable equipment come to the picture again. Non-inflatable pool basketball hoops are accustomed to being more stationary than inflatable ones. This means that non-inflatable equipment will take up some poolside space when in use and storage space when it is time to put the equipment away. If you have some pool deck space left, then make sure you measure that first before buying a pool basketball goal. If your poolside space and storage are very limited, then you can opt to buy the inflatable ones which you can just put on the water when playing it, deflate, fold and store it afterward. ​5. Know your group's playing style. Look at how your friends or family play. Do they shoot the ball from every angle or do they follow the traditional shooting style wherein the ring is fixed in one place? If you think that they will have more fun with shooting from different areas, then it's best if you get the inflatable basketball goal since you can put it on the center of the pool and have everyone shoot from where they are. However, if you think your friends will enjoy the more traditional way of playing ball, then get the goals with the bases. ​6. Consider the kids, too! 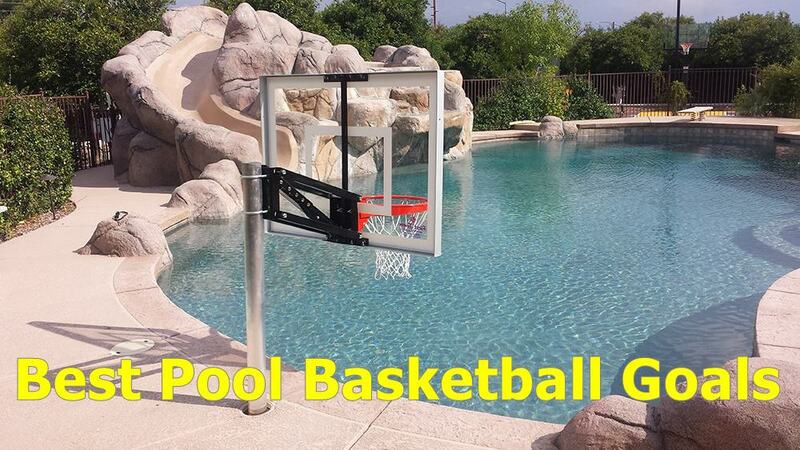 Some pool basketball goals can be adjusted. If adults are the ones who are mostly going to play then this would be perfect, but what about the kids who would want to join in the fun, too? There are basketball pool goals that go to as low as 4.5 inches from the ground, so this can be of help to the kids. But inflatable basketball goals are really the best way to go when you have little kids. In this way, you can adjust how far the ring will be from the kid. 7. Go for the combination volleyball and basketball pool sets. Some might have a pass on this one, but it's alright! There's really no harm in buying a 2-in-1 set but do this only if you know you are going to use both games. You wouldn't want to spend money on an extra game that you won't be able to use. This way, there could be twice the fun and your guests would be more thrilled in having more than just one game. If volleyball is not your cup of tea, then you can opt to buy those basketball pool sets instead. These are sets complete will the proper ball that would go with your basketball pool goal. Here are just the basic things you would need to know about choosing which basketball pool goal will suit your needs the best. Again, when it comes to pool games, it is not about winning or losing -- it is about the fun that you have enjoyed with your family and friends. 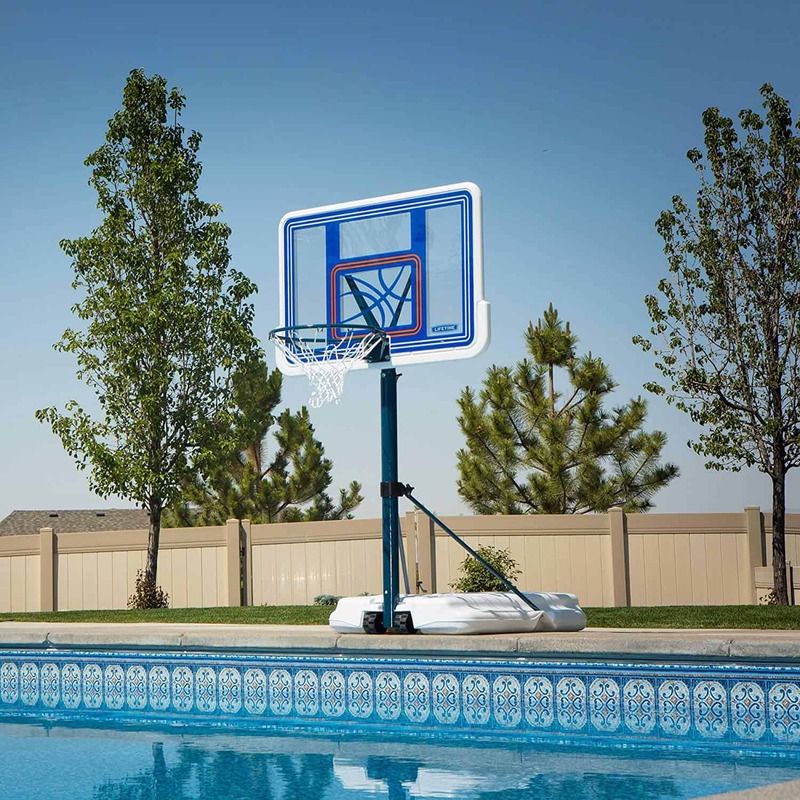 If you are still having some doubts on whether you should buy a poolside basketball goal, trust us – this is one thing that you will not ever think that will need, but you end up looking for it once you get bored from just swimming in your pool.